90 x 600mg High Strengh Veg. Caps. A food and medicine since biblical times. Moses reportedly decreed that men who cultivated the tree be exempt from service in the army, the oil is symbolic of purity and goodness and the olive branch represents peace and prosperity. More recently, the active ingredients in the leaves, two phenolic compounds (oleuropein and elenolate), have been isolated. Oleuropein has been found to inhibit two types of fermentative bacteria which, incidentally, is why olives are often cracked before picking and the phenols removed, since they inhibit fermentation. In an animal study oleuropein given in intravenous form was found to decrease blood pressure. In vitro studies have also revealed that oleuropein inhibits the oxidation of LDL (bad cholesterol). As such, it may help to reduce the risk of coronary heart disease in vulnerable people, since oxidized cholesterol is easily deposited, causing blocked blood vessels. 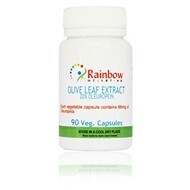 Olive leaf extract is increasingly used as a supplement for fatigue and boost the immune system. It is also recommended for sore throats, coughs, sinus problems etc. 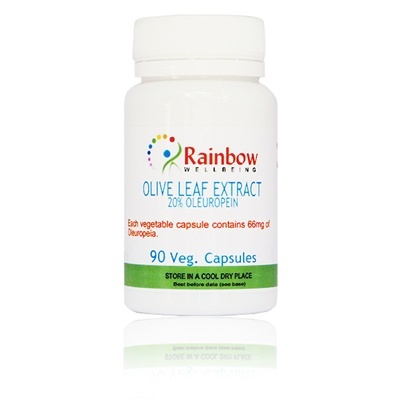 Our capsules contains Olive Leaf High Strength Extract, 20% Oleuropein 300mg + Rosehip 300mg. No other ingredient or additive of any kind. Take 2-3 vegetable capsules a day, more in times of extra need.